I just returned from an almost 3 week trip to Manitoba. And it was an adventure! Northern Manitoba on Hudson Bay is renowed for the congregation of polar bears in late fall. Tourists climb into tundra buggies and ride out to see these magnificent creatures as the ice forms on the Bay. I was able to do one better, be on the ground with these the largest of the ursines. 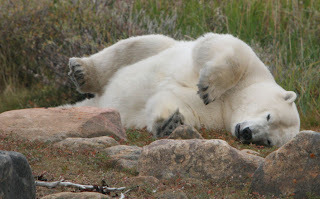 my husband and I were able to spend 6 hours alone with biologist Ian Thorleifson in the company of two polar bears. These two bears were fat! Contrary to the dire warnings printed about the demise of the polar bear, this species is quite adaptable. During the summer, bears live off the fat they have accumulated during a winter of seal feasting. They would usually be thin by September. But, Hudson Bay bears have learned to hunt beluga whales. And, they are very good at it. With 35,000 beluga whales in Hudson Bay during the summer months, bears have found a way to catch the whales which enjoy coming into as low as four feet of water. The good news is that for these bears, the more weight they put on before they hit the ice, the healthier they are. Like usual, Ian was a wealth of information since he has worked safely with polar bears for well over 20 years. You don't want to surprise them. You stay upwind of them. (not because they smell bad, but so they can smell you.) And as I practice, with all wild creatures you never invade their personal space or make them move or take any action because of your presence. We were fortunate to witness something Ian has never seen before. One of the bears got up to take a drink from a fresh water stream. Ian surmissed that the metabolizing of the huge amount of whale blubber was making the large female thirsty. 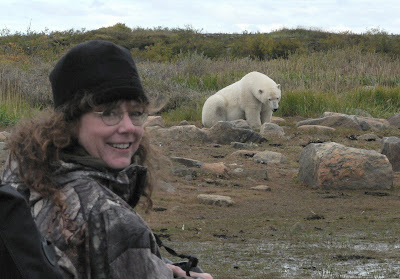 If this wasn't exciting enough, the next morning back at Dymond Lake lodge, my husband and I had an encounter with a large male polar bear. We had polar bear prints covering our tracks for several days with only fleeting glimpses of the bears. This guy was big, healthy, and beautiful. But that is another story. Note: Polar bears are dangerous large animals. People are mauled or killed every year. Do not try this at home. Some of the species we saw in Manitoba and on the drive up and back were: bobcat, black bear and cub, sandhill cranes, snow geese, Ross' geese, arctic fox, Canada geese, green-winged teal, cougar, beaver, polar bears, black ducks, eiders, scoters, widgeon, a variety of shore and song birds, tundra swans, and a weasel. With over 2600 reference photos, and lots of stories, you can expect to see from paintings from this trip.... soon. In case you think I may have made the above bear nervous, here she is a few minutes later. A number of years ago we took our 4WD up the spit of land at the far eastern end of Chappaquiddick on Martha's Vineyard, Massachusetts. The nesting birds the end of May were amazing. 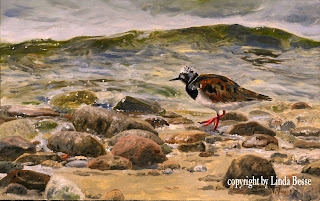 One particular bird which captured my attention was the Ruddy Turnstone. It is a standout with its striking plumage. 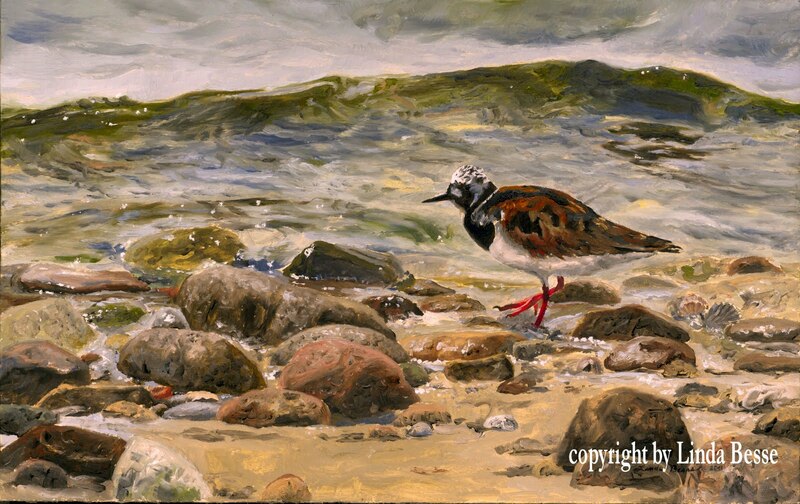 The Ruddy Turnstone feeds by turning over shells, stones, and seaweed with its strong beak. It eats mollusks, sand fleas (yeah! ), and crustaceans. 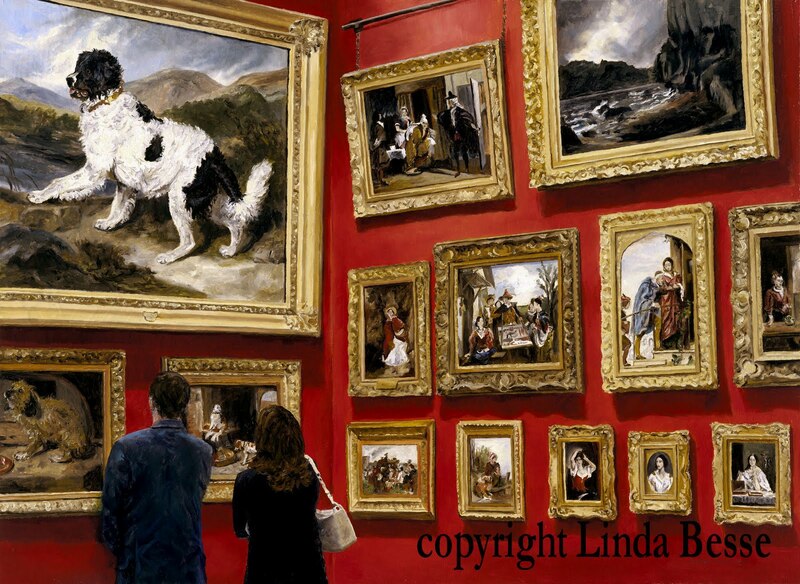 My painting Art Appreciation has been accepted into the Oil Painters of America Western Regional Juried Exhibition of Traditional Oils. More than 700 OPA Members applied and only 85 works were selected. I am honored to be part of this show. With our political climate heating up, I thought this title fit the piece. These are nesting gentoo penguins which I saw on my trip to Antarctica. 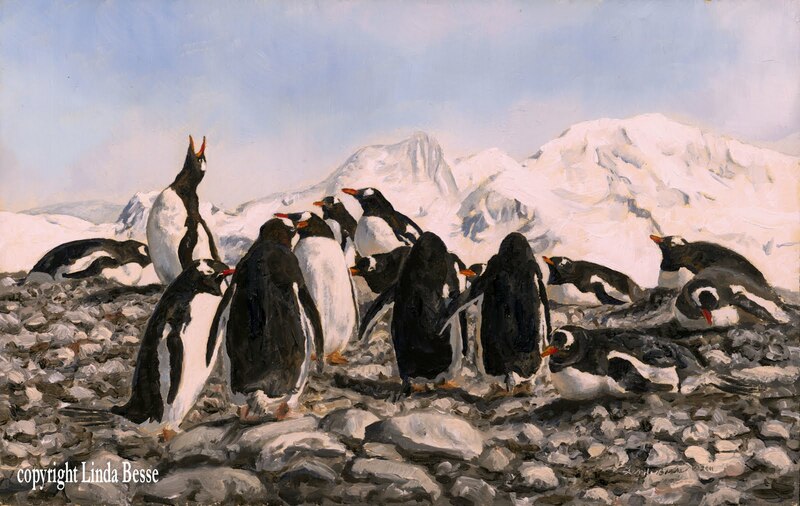 I would have to say of the four species of penguin which I saw (Magellanic, Gentoo, Adele, Chinstrap), I think the markings of the gentoo are the most striking. One of the things which gives me the giggles is the group name for a number of animals. Since we were children, we learned a flock of birds, a herd of cattle, and a pack of wolves. Now I don't know who or what group came up with the more inventive names, but I love them! Here are a sampling: a descent of woodpeckers, a pocketful of kangaroos, an ostentaion of peacocks, a trunkful of elephants, a clowder of cats, a murder of crows, and one of my very favorites, a leap of leopards. (I have also seen a spot of leopards.) 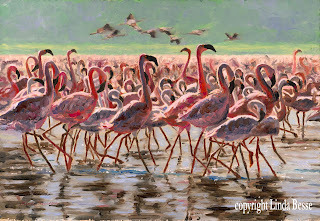 It just so happens that flamingos come in flamboyants. How appropriate. And hence, the title. Painting nature I don't have the chance to use bright pinks, reds, and oranges often. Even though there is a lot of detail in this small piece, the brilliance of the colors makes the time and small brush work fun. 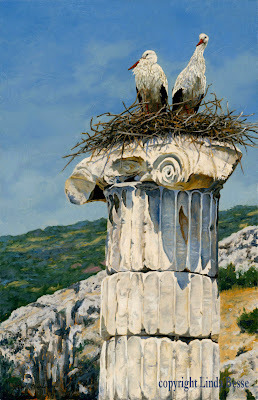 I am thrilled my painting Birds On Art has been juried into the 6th Annual International Guild of Realism show. Just this last year I joined IGOR after I saw mention of their show at the Leigh Yawkey Woodson Art Museum in Wausau Wisconsin. 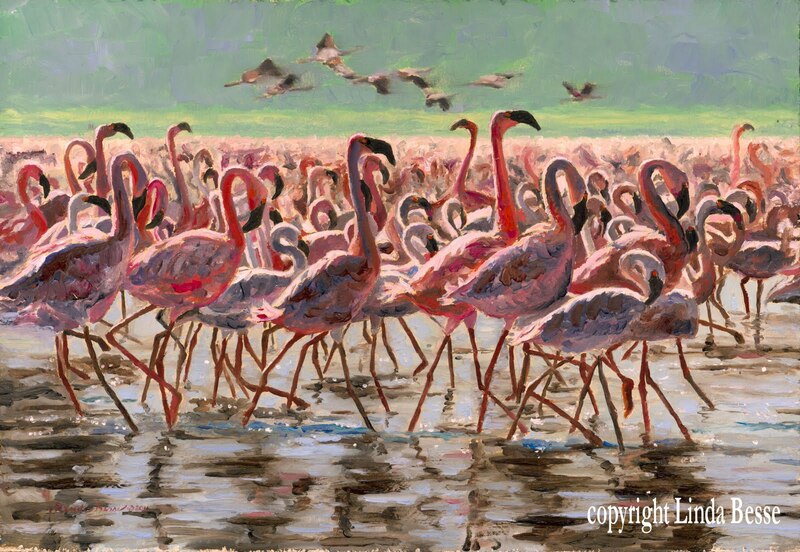 This year the show will be held at the Sage Creek Gallery in Santa Fe, New Mexico. 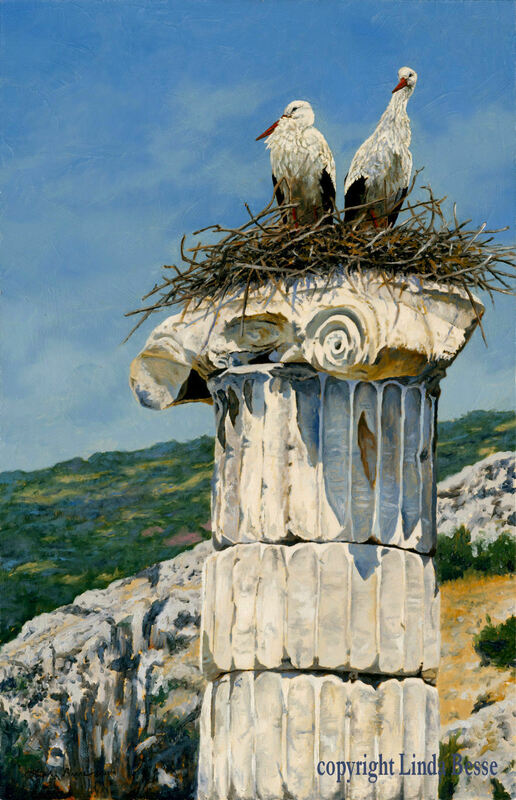 The Opening Reception is September 30th and runs through October 22nd. If you have a chance to swing by and see the show, I am sure you won't be disappointed. I am looking forward to attending the opening weekend and seeing my colleagues' work from here and countries around the world. 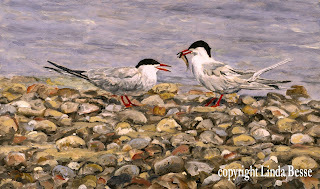 These Common terns on the shore of Martha's Vineyard were a joy to watch. It was early in the season and they were in the "Look at me, I am a good mate" mode. She seemed quite taken with him, so I think she will say yes. My next several small pieces are birds. I think birds translate well to more modest sizes. Once I finish this group, I will start blogging paintings in progress.